An essential item in your contemporary-style home, this stationary sectional offers bold style and plush comfort all-in-one. From plant-based, polyfoam cushions to tapered track arms and high metal legs, this sofa has the look and feel you need to create an exciting and inviting place to lounge. Its left-arm-facing chaise makes it easy to kick back with your feet up, while its right-arm-facing sofa leaves plenty of room for relaxing with family and friends. The perfect addition to your family room or entertainment area, this 2-piece sectional will complete your home. 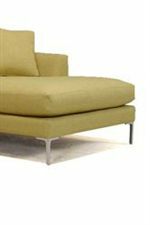 The 0351 Contemporary Sectional Sofa with Metal Legs and Left-Arm-Facing Chaise by McCreary Modern at AHFA in the area. Product availability may vary. Contact us for the most current availability on this product. 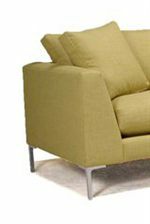 0351-CL Left-Arm-Facing Chaise 1 60" 44" 32"
0351-SR Right-Arm-Facing Sofa 1 80" 36" 32"